If you're on the lookout for a special experience, the UC Botanical Garden has just the ticket. 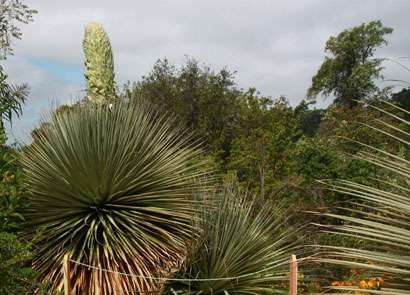 Its endangered Puya raimondii, a flowering plant not-so-modestly known as the Queen of the Andes, is in the process of producing a giant bloom that could shoot 30 feet high and feature up to 30,000 flowers. Its dramatic life cycle change happens in the wild only every 80 to 100 years. UC Botanical Garden Director Paul Licht said that because the Puya blooms so rarely, and there is so little literature available about it, it is hard to say why the largest bromeliad species in the world appears to accelerate its pace in the UC Berkeley garden, which is not much above sea level. The 24-year-old plant, near the Garden of Old Roses, in the 34-acre garden nestled in Strawberry Canyon above the University of California, Berkeley, campus. Grown from seed, it has been under the watchful eye of garden crews since the early stages of its bloom were detected a little over three weeks ago during a Saturday morning bird-watching walk. The Puya is pollinated by hummingbirds and perching birds, which are found in the garden in abundance. Since then, the increasingly bulbous bud, with outer leaves that resemble the skin of a cactus, has ballooned from the size of a basketball to something closer to a surfboard. A wooden viewing platform is set up on the southeast side of the Puya, so visitors can get a close-up and personal look without trampling the surrounding area. Licht recalled the story of how the Puya seed arrived at UC Berkeley. In 1990, Larry Dorr, now with the U.S. National Herbarium at the Smithsonian Institution in Washington, D.C., was working for the New York Botanical Garden when he and a colleague went to Bolivia to make floristic inventories in Andean countries. Reached recently by Licht, Door recalled the two excitedly crossing the Altiplano (high plains) from La Paz to Comanche to see the Puya raimondii in the wild. "We were not thinking about collecting, and when we did see the plants in flower and fruit, we succumbed to the temptation to try to make several herbarium specimens," he wrote to Licht. "Lacking ladders or pole pruners, we managed to dislodge parts of an infructescence (fruit) by throwing rocks at the fruiting stalk. We all joined in, and I do not remember now who had the best arm." The herbarium specimens were deposited in herbaria in La Paz, the Bronx and Washington, D.C., and distributed various places, including in Strawberry Canyon in 1990, where it is now taking center stage. 'I find it remarkable and ironic that I am writing you 24 years to the day after we collected the plants," Dorr told Licht. "I am glad you were able to coax Puya raimondii into flowering and am pleased your visitors will be able to marvel at this plant, too." This particular Puya is younger than the 28-year-old one that bloomed in the UC Botanical Garden in the late 1980s – it also reached this stage much earlier than it would have in the wild. That bloom, probably the first ever in a botanical garden, is said to have drawn thousands of visitors, even exceeding the turnout for the eruption of the so-called Corpse Flower or Stinky Plant, which has happened a couple of times at the garden in the last decade. More information: Check here for the latest photos and developments with the Puya and possible programs relating to its blossoming.